I’ve made various bread recipes, but this was my first try making burger buns. Why did I wait so long? These Beautiful Burger Buns from King Arthur were fantastic. Butter brushed on top adds to the flavor, and the texture is soft but not air-filled and squishy like packaged buns can be. They were quick and easy to make, and I’m thrilled to have four more in stashed in the freezer. I served these with these Bulgur-Bean Veggie Burgers – my favorite veggie burger recipe. If you’re looking for a non-vegetarian burger recipe, these Curry Turkey Burgers are fantastic – the curry paste punches up the not-so-flavorful ground turkey. I buy curry past in tiny cans and still have leftovers when I use it in a recipe, so this is a great way to use up the leftovers. Michele made burger buns too, but she tried a different recipe and made a vegan version, so do check out her blog to look at her photo and recipe – they look fantastic! As good as mine turned out, I need to try her recipe too! ^good. Mercy, I hate this iPhone keypad sometimes. Your buns look gorgeous. I’m going to have to try that recipe. Your photo came out really nicely as well. Those look perfect! The veggie and tukey burgers sound awesome too. My current fav veggie burger is one from mama peas and has thai flavors but now I want to try your recipe! These buns look absolutely spectacular! Nicely done!!!! 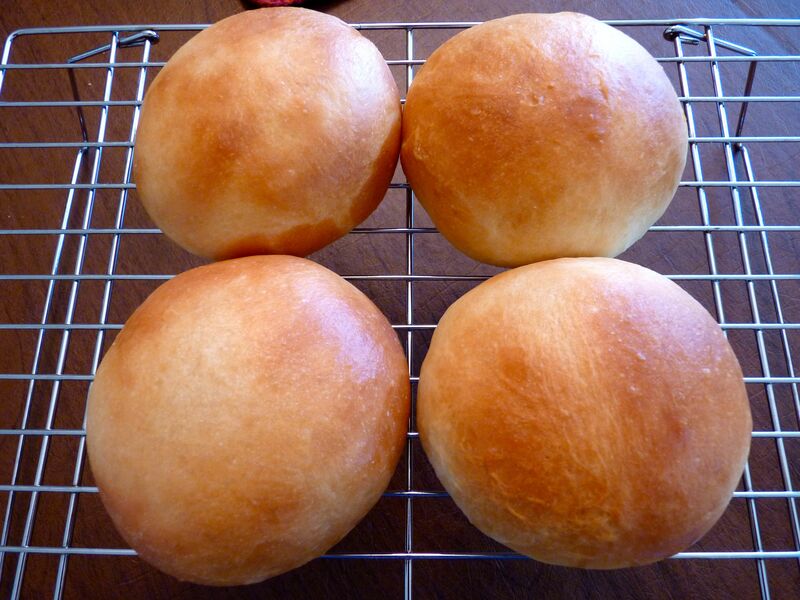 This is my favorite homemade hamburger bun recipe – it really is the best, so much better than anything you can buy from the store! These buns sound delicious, and so do your veggie burgers! I love the way your buns came out looking all golden. Your burger buns look fantastic – so smooth and perfectly formed. Wow, these look amazing. I’d never thought of making my own burger buns! Do they have a whole wheat recipe? Hi Beth, I don’t see a specific whole wheat burger bun recipe on King Arthur’s site, but they do have quite a few wheat bread and bun/roll recipes. I’ve had great luck with their recipes, so I don’t think you can go wrong with King Arthur!